The immediate aftermath of a car accident can be chaotic. In the heat of the moment, it may be difficult to remember exactly what you should – or should not – do to protect your rights. Once you are safe, it’s best to contact a San Diego car accident attorney as soon as possible to ensure you do not accidentally compromise your ability to obtain fair compensation for your injuries. 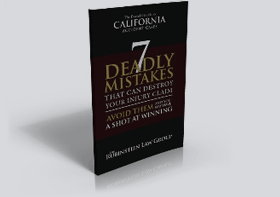 Our experienced San Diego car accident attorneys offer free case evaluations. Please contact us at (855) 365-9955 today if you need help with a car accident injury claim. The first and most important thing you should do after any car accident is seek medical assistance. Call 911 and wait for a medical professional to arrive on the scene. Everyone involved in the accident should be examined, even if they feel “fine.” Some injuries – such as brain injury – may not become apparent until days or even weeks after the car accident. When the police arrive, they will ask you questions and write a report. Be cooperative in answering their questions, but do not discuss fault or apologize for the accident. Ask for a copy of the police report when they’re finished. Do not answer any questions from insurance company representatives at the scene. You should only discuss the accident with the police. If you or one of your loved ones has been seriously injured in a car accident caused by another person’s negligence, don’t settle for less than you deserve. The settlement the insurance company offers you will almost always be far less than your case is really worth. Please contact The Rubinstein Law Group today or call (855) 365-9955 today to schedule a free case evaluation with one of our experienced San Diego car accident attorneys. We can help you fight for the justice and fair compensation you deserve.